Property 2: Charming Country Cottage with amazing views. From the initial arrival at the house it was clear that this was a quality property. On entering the house that impression was confirmed and you were at home immediately. The spacious kitchen diner and the upstairs lounge are superb and mean that you can eat communally and then separate to chill out. Each of the bedrooms is really well equipped , beds were comfortable and contributed to a great nights sleep from day 1. externally the garden and the outdoor furniture on the deck are a real sun trap and the Pod is an absolute gem. great for chilling out and relaxing, or if friends come up unexpectedly because the weather is too good!! And it was sunny on everyday bar one. 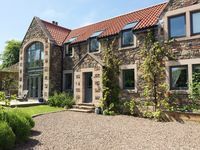 We have stayed in numerous properties in Cornwall, Northumberland and the US for family holidays and this was without doubt the best of all. Superb!